Automobile Bearing are known for their excellent performance, dimensional stability and low maintenance cost. Before the final delivery, a team of quality inspectors stringently examine all these bearings on varied parameters to ensure their flawlessness. The inner and outer ring raceways and rollers of these bearings are made with a taper so that the surface planes of the raceways and roller axis meet at a point. The rollers are guided by a flange on the inner ring. Being customer friendly, we offer our range of Automobile Bearing at industry leading prices. They are widely used in gear drives and reducers, automotive front and rear axles, guide box in bar and rod mills, conveyor and transfer equipment and so on. 1. Material: outer ring is mild steel; inner ring is bearing steel. 2. Heat treatment: inner ring quenching and spherical chromium plating. 3. 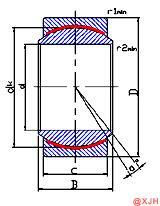 Structure: Product Extrusion molding; oil hole without oil groove. 4. There is a layer of PTFE sintered copper wire in the middle of the inner and outer ring. 5. Performance characteristics: self-lubricating, resistance to Utamaro loss, self-aligning, low friction characteristics, suitable for low-speed, heavy-duty mechanical Mechanism.